In certain locations the soil will not adequately absorb the water being discharged by the septic tank. In these instances an alternative to a conventional septic system must be used. A common solution is a sand mound septic system which replaces the standard field lines with a specially designed and constructed mound. Install the two tanks. Unlike conventional systems the mound system will require two separate tanks. 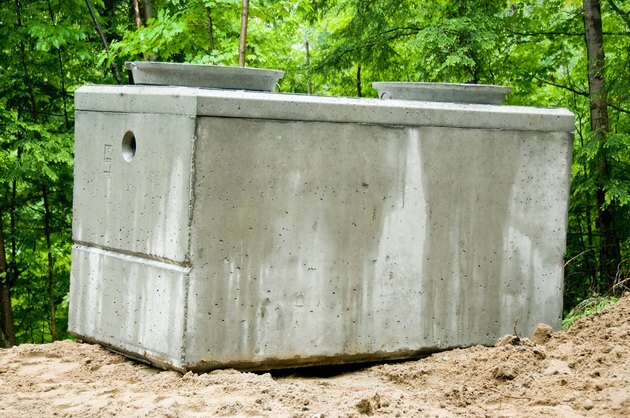 The first will be a standard septic tank buried at a depth of 10 to 16 inches and located a minimum of 10 feet from the foundation of the house. The holding tank will be located a short distance away from the septic tank but will be buried approximately 12 inches deeper. These two tanks need to be connected by a 4 inch PVC schedule 40 pipe. Both tanks need to be level and square. Allow a professional with a crane or other device to lower the tanks into the ground. These tanks can weigh several thousands pounds and can be hazardous to maneuver. Dig a trench from the house drain to the inlet side of the septic tank. Dig a second trench from the outlet side of the holding tank to the area where the mound is to be constructed. At this time you should also till up the soil under the mound area. Attempt to till up a minimum of 24 inches of top soil in order to allow the system to function properly. The trench for your pipe needs to terminate at the center of the mound area. Install 4 inch PVC pipe from the house to the septic tank. You will also need to install a short piece of 4 inch pipe between the septic tank and holding tank. A 2 inch pipe will travel from the holding tank to the mound area. At the mound area the pipe will need to turn up at 90 degrees and extend up approximately two feet above ground level. Plumb in the submersible pump inside the holding tank. A threaded adaptor will be used to connection the pump to the two inch line you installed in the previous step. Be certain to use PVC pipe cleaner and ample amounts of PVC pipe cement to get a secure fit at all joints and pipe connections. Run a direct burial wire from a power source, through the trenches, to the pump. Tuck the wire beneath the pipe to help protect the wiring from any misplaced digging which may take place in the future. The pump should be protected by a Ground Fault Circuit Interruption (GFCI) device. Create a mound of sand over the tilled mound area. The size of the mound will be determined by the size of the septic tank and the results of the perc test. Build the mound so the sides are gentle slopes to help prevent erosion and make mowing easier and safer. On the upper level of the mound place a thick of gravel. From the pipe you installed earlier, created an H shape using perforated PVC pipe. This H created out of the piping must be as level as possible. Atop this piping add another layer of gravel, then cover the entire mound with a 6 to 10 inch layer of soil. You will need to plant grass on the mound to curtail erosion. The greenery also helps with the evaporation process.